Showing results for tags 'BikeProtection'. The adventure bike’s skid plate, or bash plate as the metric-types call it: it's not a terribly complex piece of equipment, one would think it would be easy to make an effective plate. Yet there are many different designs out there ranging from comically ineffective, to overweight overkill. Since it’s such a simple bit of hardware, one would think there’s not a lot of reason to charge more than, say, $300 for a really good one. Why then is it so difficult to find a good skid plate for the big adventure bikes, that effectively covers all the vulnerabilities under the bike, whose cost doesn’t leave you feeling like your wallet is the thing that needs armor plating? When XLADV asked me if I would like to review the new ACD Racing Parts skid plate for the BMW R1200 GS/GSA, ‘06 - ‘13 bikes, I was quite interested. Early on with my ‘13, I was quite aware that the stock skid left some huge gaps in the protection of the engine. It’s not terribly robust in its ability to protect what it does cover and offers no protection for critical items like the oil filter, O2 sensors, or the clutch cover. I began checking around the market for a good aftermarket replacement. There were some that simply, on sight, were no better, or even worse than the stock plate. Some that looked like a great design, but lost me because they were made of unnecessarily heavy steel. I had settled on a very expensive skid plate--prohibitively expensive, but it had everything I wanted, so I was planning on just waiting a couple more paydays, holding my nose, paying the money, and being done with it. That was when XLADV came calling. The timing couldn’t have been more perfect. First Impressions While I waited for the product to arrive, my expectation was that since I’d never heard of ACD Racing, they were probably a tiny shop that didn’t offer a lot for ADV bikes or a new arrival to the ADV market, and might not even be very effective protection. At best, I speculated, it will be nice looking and priced at or above $400. In a couple days, the skid plate was in my hands. As soon as I had the package open, I knew that ACD was onto something. the aluminum was thick, the welds looked strong, and the rear mounting looked solid. Some might argue that the back side welds could be more robust, but the pragmatist in me is only concerned with depth, coverage, uniformity and (for aluminum) that there is no obvious contamination. My first impression was that this was exactly the plate for which I had been searching. It came with the plate (a two- piece affair), a small goodie bag of mounting hardware, but no instructions for installation. The first thing I did was find ACD Racing on the web. I needed to know what this skid plate cost. I was absolutely floored by the $280 price tag. Nothing I had found previously, that was anywhere near this build quality, was anywhere near this price. Now I was excited. This quality of plate, at this price, needs more attention in the market place. But before I go bananas about this thing, first I have to install it and get it out in the desert; the chickens haven’t hatched just yet. Installation Before the product arrived the folks over at XLADV mentioned something about probably wanting to install the bracket first (ed. turns out ACD recommends it be installed as one piece after all. oops!). At the time that comment didn’t find traction in my mind, but now that the parts and the bike were sitting side-by-side, it made perfect sense. What passed for instructions had been emailed to me. It was a PDF of an engineering drawing of the skid plate with some annotations added here and there to show where the hardware goes when installed. The instructions didn’t mention this, but the rear part of the skid that mounts to the bike’s frame, can be removed from the plate. This will also come in handy later for oil changes and other under-the-engine service that requires the skid be removed. The instructions were almost passable and I managed to figure out some critical details from them, but they could have been much more comprehensive. As with most service to the bike, my first order of business is to get the bike up on the lift and on its center stand. The old skid comes off and I line up the ACD skid to see how it fits and what bits of frame accept the rear mounting of the skid plate. What I find is that the skid mates up to the frame extensions that mount the center stand to the bike, so installation must be done on the side stand. Overall, installation was a bit fiddly, but nowhere near the level of making one crazy. I spent just short of two hours getting it all hooked up, but with better instructions that allowed one to understand all the steps involved, not have to figure a few things out, and perhaps a few tricks thrown in, it could have taken an hour. If you’re even moderately mechanically inclined, you should have no trouble doing this in the comfort of your own home. The rear mounting bracket went on first. The left side was the most difficult and here is my only real complaint about the design. The right side is very easy to get bolted in just like stock with the center stand bushing as the nut, while the left, for a reason I can’t see, uses a very long bolt that threads through the center stand pivot bushing and into a nut that has to be precariously held in place on the back side of the mounting bracket. I would be interested to see if ACD can explain this better with proper instructions or if they can change the design to have the left side match the right. Once the rear bracket was sorted out it was time to bolt up the plate attach it at the front. This was pretty straightforward until I got to the front bolts. 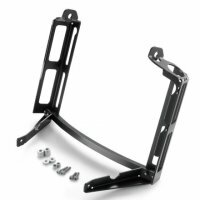 For some reason, BMW made their forward skid plate mounting bracket with elevated ends such that any flat skid plate will need spacers to bolt up firmly. As a result, there is a gap at the bolting locations of a flat plate like the ACD, and those gaps are different on the right than on the left. ACD fills these gaps with two washers as spacers on the left, and one washer on the right. They fill the gap correctly, but they are very difficult to get in place while you get the bolt through, aligned and then threaded. There is not a lot of room to work between the plate and the bottom of the engine. Again, not a deal-breaking problem, but worth mentioning. I would have liked to have seen the appropriate width spacer for the right side. One spacer would have been easier to get in place than two washers. Tips: Get the side that needs two washers done first, you’ll have more room to work. Use a telescopic magnet to slide the washers into place. Experiences Once the front bolts were in place and secured, the two rear bolts were were tightened and torqued and it was ready to ride. The ACD Racing skid plate looked great. Its design is a full tub, wrapping up around the engine and the exhaust. It looked great and added the needed coverage that the stock plate doesn’t even try to provide. First rides were around town. I had deliberately not used any thread locker on all the bolts on the bottom of the plate to see if they would begin to work their way out. The all held fast in about 300 miles of city freeway and 200 miles of dirt, but you should always use a good thread locker. Out on trail, I ran a few very rocky, fast sections of trail. 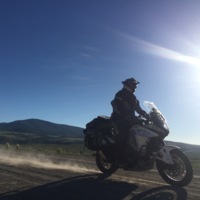 On several occasions there was the familiar twitch of the front wheel as I hit some loose rock, but instead of the flimsy prang of the stock skid plate, there was the satisfying heavy ring like a big bell. With the stock skid, when I heard or felt those same hits, I would cringe and spend the next few minutes making sure the bike still ran right, now I just smiled inside my helmet and kept on chugging down the trail. It took some pretty good shots and has only a couple little nicks to show for it. All told, knowing what I know about this skid plate now, I would absolutely buy one. The price is unbeatable. Any difficulties I had with installation are minor for the quality of this skid plate at this price. In fact, remember that super expensive one I mentioned earlier? Nevermind. You know, you think you know someone... 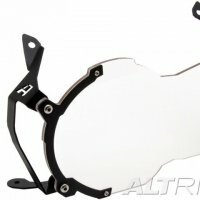 I know the folks at AltRider pretty well but was surprised when I saw these new cylinder head guards for the water cooled boxers. Does anyone currently have these installed? I like them a lot. 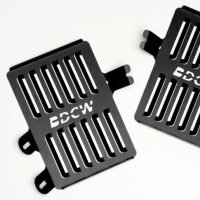 ACD Racing has a new skid plate out for the GS/GSA LC models. I know Isaac Feliu swears by this skid plate. Two of our AZ members have them too and I've heard good things. From what I've seen, ACD appears to be the more affordable yet still well designed plate compared to say, AltRider or Black Dog. 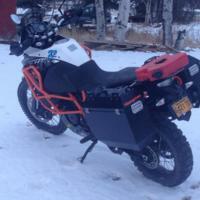 This is now on their US website for sale Noteworthy: Skid plate attaches to frame, not engine. They have a contact form on their site where you can send them a message. They're also on Facebook. 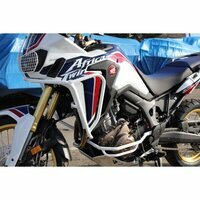 Engine guards for the 2016-17 Honda Africa Twin. 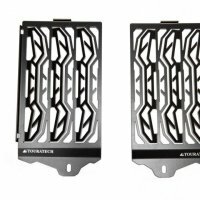 Our aluminum radiator guards are designed to allow plenty of airflow while keeping rocks and debris out. With their sturdy design and durable powder coated and anodized finishes, they will provide years of protection.VERY easy to install. My wife and I purchased this bike brand new and we absolutely love it. 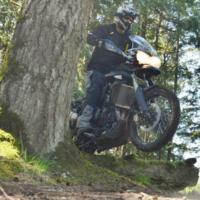 What did YOU do on your bike today? 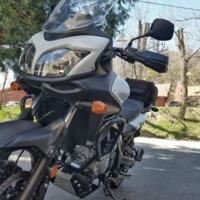 The BMW R1200GS has a powerful yet wide motor, and you want to protect every inch. Wrap that 1200cc gem with our 1 inch stainless crash bars. AltRider set the bar high on this product. 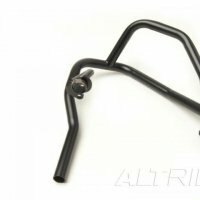 Durable and well engineered, the AltRider crash bars are built with precision-manufactured mounts that fit directly into the existing motor mount. By utilizing the R 1200 GS’s robust frame mount and incorporating the existing frame hardware, AltRider designed a quality piece that will protect your motor. 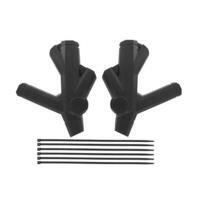 Unlike other crash bars, these do not use flanges or weak tabs and are not hung: they are actually mounted. Made with a shot peen satin finish means that even when the bike takes a spill, the stainless bars will never show signs of rust. These crash bars deflect the impact from the cylinders and engine case to the strongest parts of the frame. Unlike other manufacturers, our design provides plenty of clearance around the vulnerable left oil line. It also serves double-duty as a boot rest on long rides! Save yourself hassle and frustration – and the purchase of a $200 valve cover – by installing AltRider crash bars. 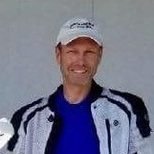 An advantage to the AltRider design is the comprehensive protection provided to the valve cover. This is especially important on 2010 and newer models because contact to the valve cover can cause the gasket to dislodge resulting in massive oil loss. Take a moment to review the instructions. 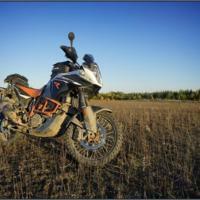 The reason we mention this here is to make you aware which mount points on the R 1200 GS have strength. You may also want to watch the installation video (click the thumbnail to the right). You’ll see everything that comes with your purchase, the tools you’ll need to complete the installation, and tips and tricks to make the process easier. *Works with 2008 and newer GSA but does touch bottom of tank on right side (see photo). R 1200 GS crash bars available in silver, black, white,red and triple black. R 1200 GS Upper crash bars available in silver, black, white, red and triple black. Fits 2003-2013 Stainless construction fights corrosion and rust Hand TIG welded crash bars are 1 inch diameter for additional strength Manufactured in America Refined satin peen finish T55 Torx driver provided with the hardware for installation Compatible with BMW OEM plastic and aluminum cylinder head guards Removal required for valve adjustment Fits with Akrapovic full exhaust shotgun style Note: Compatible with Remus header, approx. 1/2" of clearance on the right side Note: Not currently compatible with Two Brothers header. 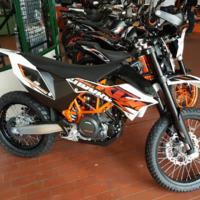 Amazing bike. Little high geared for my style of off-road riding. Excellent suspension and plenty of power. Most versatile bike I have ever owned... bar none.